Have you ever stopped to wonder how many ‘craft’ breweries we have in this country now? The ANZ report from 2014 lists some 97 breweries/brewing companies of one sort or another. That’s pretty damn high, well done New Zealand! At the same time I first read that list, two things occurred to me. First: there are breweries missing. I could think of at least two breweries that should be on that list. Second: there are breweries on this list that shouldn’t be there. At least three were known to be out of business at the time of publication. And that really got me thinking: How many breweries have gone out of business in this country? I could think of about five off the top of my head. How many more were there? Ten? Fifteen? I brought this question up with some Beer Geek friends at the pub, and we started making a list. Twenty breweries in, I realised this was a bigger job than I’d bargained for. So I started digging. The most complete list of New Zealand Breweries I could find, both current and defunct, is on RateBeer. But even this is missing some that I know have gone under. So I did some more digging, and I made a list of my own. 1) They are independently owned. Lion, DB and Independent are forever creating and dissolving new ‘brands’, most of which are of little interest to ‘craft’ drinkers. So for example I haven’t included The Temperance or Estadio, which were the predecessors to Black Dog here. Conversely, I probably would make an exception if Black Dog were to close, and put them on the list, because they are of interest to the ‘craft’ crowd at large. 2) I’m only including breweries that have shut down since 2009. This may seem a bit arbitrary, but I have done so for good reasons. Firstly, if I went back much further this list would be impossibly long. If I went back to the 50’s and 60’s, when Lion and DB were shutting down their competitors left, right, and centre, this list would be massive! Again, there are some exceptions to this rule, e.g. Historical significance. So Bean Rock Brewing will not be found here, but Limburg Brewing is (see below). Finally: Caveat Lector. I’m suspect I’m digging into some unpleasant, even painful memories with this post. I’m not doing this to gloat; I’m interested for posterity. Don’t shoot the historian. Formed by Graeme Mahy. 666 was always the brewery without a brewery. Mahy was the original brewer at Moa, before working at Murray’s Brewing in Australia. After that, he knocked around New Zealand trying to find a location to set up shop. A couple of years was spent contracting and collaborating and generally making good beers. 666 was shut down last year when Mahy decided to return to his old post at Murray’s. Last seen in the wild: kegs are still out there but will be in in rapid decline over the next few months. Ad Lib Brewing was Fraser Kennedy and Hayden Smythe. To my knowledge they produced three beers under the label. Last seen in the wild: Went out of business 2012, Isolated bottles appearing as late as 2014. The Ale Brewing Chaps was an initiative of five people: Ben Middlemiss, Vrnda Duncan, Alan Knight, Jerry Wayne and Rob Hillebrand. The idea was to brew beers for festivals. The brewery they used still exists on Waiheke Island, operated by Wayne under the name Relativity Brewing. Last seen in the wild: December 2014. 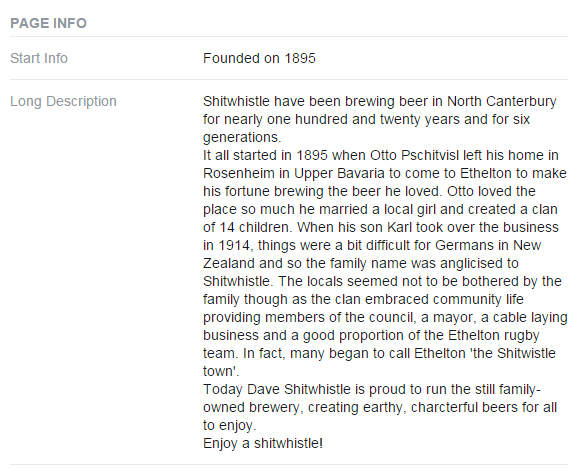 I’ve only included this brewery because it exists as a weird listing on Beer Tourist. No reliable online information could be found. Asking a few of my friends that have been in the industry longer than I have, I discovered that they were based in Porirua in the 80’s-90’s, not in Hunterville, as Beer Tourist suggests. Based in Arrowtown, started in 2008. Seems to have gone out of business some time in 2013. Last seen in the wild: Bottles still surfacing as late as January this year. Tap seems to have dried up in 2013. Formed by Vicki-Marie Yarker. They produced a wheat beer that I remember pouring at Hashigo. 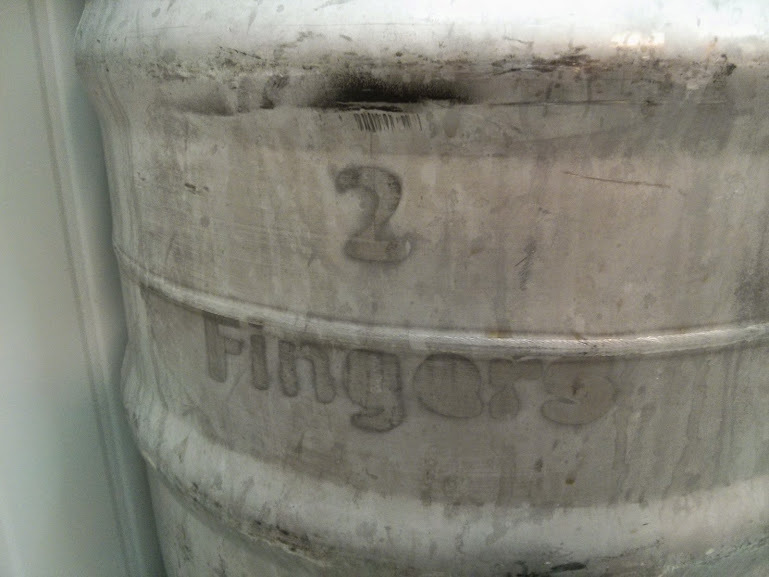 A rampant infection turned the beer into foamy acid in the kegs. They also produced a ‘snakebite’ cider. CORRECTION: despite a hiatus of somewhere between 3-5 years, it seems that Beltane has not ceased to exist. I’ve been informed that they currently have a new beer aging in port cask. I greatly look forward to it’s release. FURTHER CORRECTION: I have since learned that there were in fact two batches of Wheat Beer produced by Beltaine. Only the second one showed signs of infection. Details are elusive, but seems to have started in 2012 and been the enterprise of one Wade Kirk. They made a ‘Black IPA’ and a ‘Red Pilsner’ (?!). Their logo looked a hell of a lot like the Bear Pride Flag. Last seen in the wild: Check-ins of the Saboteur Red Pilsner from 2015 cannot be trusted, as at least one has a picture of the wrong beer. Last reliable check-in is from November 2013. Started circa 2011 by Lawrence Van Dam and John Morawski (who now has a contract brewery called ‘Laughing Bones’). They made a Dubbel and a Belgian IPA that were mysteriously similar in ABV and colour, which I always suspected of being the same beer with different hops. Britomart went out of business in early 2013. 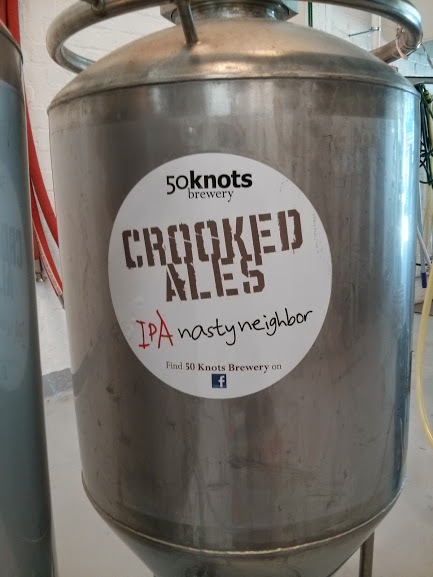 Last seen in the wild: Strangely it seems that a few kegs have surfaced recently and have gone on tap at Vultures Lane. I’ve written a little on the history of Crooked here. Technically they’re still producing cider, but they make the list because it really only still exists in name. The original orchards and brewery equipment is gone and the current product bears little resemblance to the original. Last seen in the wild: Still in production. An old piece of 50 Knots’ equipment recently spotted at another brewery. Started in 2012, Geek was the product of Andrew Cherry. They made one very nice Coconut Porter before disappearing. Last seen in the wild: Isolated bottle appeared December 14. 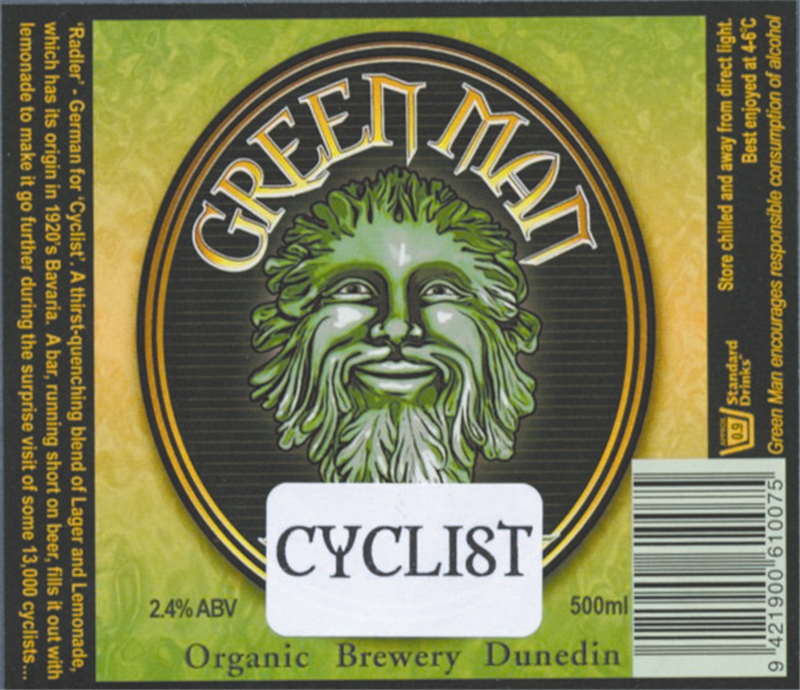 Based in Dunedin, Green Man was the brewery that kicked off the whole ‘Radler’ debacle – a textbook case of the mega brewers trying to muscle the small guys. I fondly remember voting in favour of the SOBA initiative to go to bat for Green Man in the IP court at the AGM, circa 2009; a memory I look back on with irony, as I always disliked the brewery. There’s a lot of history in this one image. Frankly, their beers were at best pedestrian; at worst a parade of infections and brew faults. We all knew that Green Man wasn’t going to last in a market with consumers increasingly demanding quality. Having said that, they did circle the drain for about two years longer than I thought they would. Last seen in the wild: Still available in many places. Launched by Nathan Crabbe and Ally McGilvary in 2009, and went out of business some time around 2012. Nathan left to take up a job at Harrington’s, then set up Resolute Brewing (see below). Their beers were pretty good, except ‘Summer Babe,’ which I remember smelling like vomit Parmesan. Last seen in the wild: Some seems to have cropped up in California last year (?). Otherwise, last seen in this country November 2013. Hophugger was a subsidiary of Timaru based company Treehugger Organics, and appeared around the summer of 2012/13. They were one of the first beers I ever reviewed (back when I still did that). Last seen in the wild: October 2014. Formed by Edward Valenta in 2013, at that time working behind the bar at Pomeroy’s and as Assistant Brewer at Twisted Hop in Christchurch . Ed formed the company to get a bit of brewing and business experience before moving back home to the States. Last seen in the wild: September 2014. Started by Tony McDonald and Cory Watts in 2012. I will always remember Hops Valley as the brewery that had an IP dispute with Yeastie Boys over the original Gunnamatta label. Frankly I think Yeastie Boys made a good call not using this logo. Last I heard of them, they were attempting to sell their company on Trademe for way too much money (considering it consisted of a Farrah homebrew kit and a logo). They did eventually find a buyer, who has yet to surface. Last seen in the wild: August 2014. Bennett’s Beer is the stuff of legend amongst the old guard of the Wellington beer scene. Maurice Bennett set up the company in 2006. Instead of the popular method of contracting we see today – sending a recipe to a brewery and having them make your beer for you, Bennett just bought beers off other breweries and stuck his label on them [EDIT: with the breweries knowledge and consent. He may also have had some original recipes, it’s not entirely clear]. They were Harrington’s and Tuatara’s beers specifically, but I’ve heard stories of Bennett running out of beer mid-festival and attempting to buy kegs off other stands to wheel over to his stand and sell. Bennett’s shut up shop some time around 2010, but the legacy lives on, in other contract breweries that are more about having a beer with your name on it than quality and passion for the product. Last seen in the wild: Two isolated Untappds from the last two years. Ratebeer puts it at 2010. Started in 2013 by Simon Crook, an ex-LBQ bartender. This was a single-beer entity: Goldilocks Blonde Ale. Last seen in the wild: October 2013. The only reference I can find online to Kiwi Breweries is that it was in Morrinsville, and that its equipment was sold to Croucher Brewery. However, the Companies Office reveals that the directors were Gary and Valerie Hallett, that the company was registered in 2003, and last filed in 2010. Last seen in the wild: No idea. Limburg is an often forgotten piece of brewing history. People with long memories rave to me about Limburg Hopsmacker, possibly the first modern APA brewed in New Zealand (although that may be Emerson’s APA). The company was the efforts of Craig Cooper and Chris O’Leary. It operated from 1998-2006. Admittedly, this is outside my range here, but they are included here because of their historical significance: After the close, O’Leary went to become Brewery Manager at Emerson’s and Cooper went to work in Australia and Canada before founding Bach Brewing. Last seen in the wild: Funnily enough, I have the last reliable check in of a Limburg beer – September 2013, a bottle of Oude Reserve 2004 from Dom Kelly’s cellar. More recent check ins are harder to verify and may be Bach Brewing beers with the same name. Matson’s was a Christchurch-based brewery that never really made (or attempted to make) inroads into the ‘craft’ beer scene. In many ways, they were more like a macro brewery: all but one of their beers were 5% or lower, most (if not all) of their beers were lagers and several of them were actually made by blending two beers together. The only beer of theirs I ever poured at Hashigo was the surprisingly good Pine tree Black, a beer by then-brewer Colin Garland. Matson’s went into liquidation and was bought by Harrington’s, their brand dissolved, and their considerable capacity absorbed into Harrington’s. Last seen in the wild: still plentiful in bottles, but will become rarer over time. Built by Matt Elmhirst in Motueka. Monkey Wizard was sold and taken over by Simon Nicholls to become Hop Federation. Last seen in the wild: November 2013. This is an odd one. This is the ‘Commercial Brewing Arm’ of the Massey University Brewing Society (ostensibly a homebrew club). 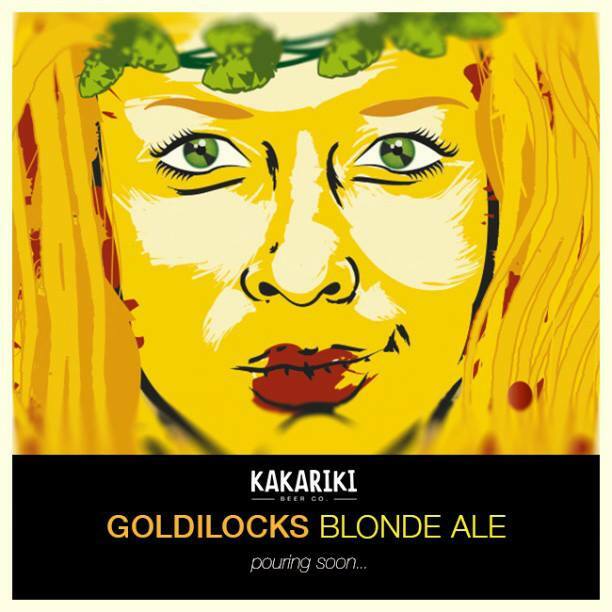 It was lead by Simon Crook, who later went on to start Kakariki Beer Co. (see above) and like Kakariki, was a single batch entity: ‘1’ Pale Ale. Presumably it was meant to be followed by a beer called ‘2’, or maybe the name was meant to be prophetic. Last seen in the wild: December 2012. 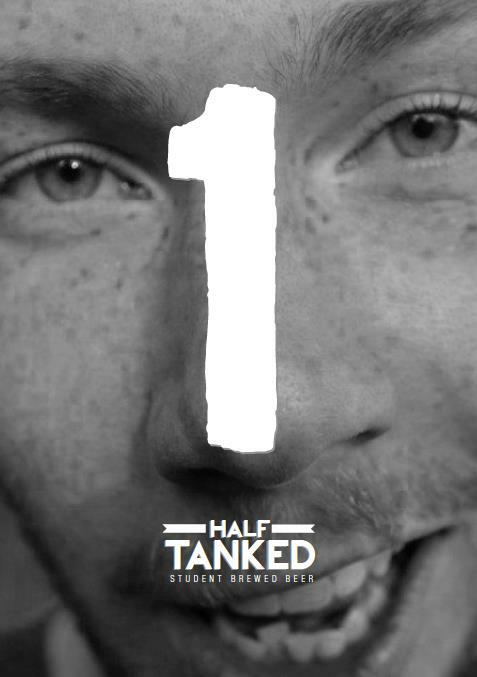 Yes, beer is made in tanks, that’s a very clever pun. But could you have chosen slightly less punchable face to market it with? Brewed out of Roosters in Napier. I feel like I’ve wailed on Naturale a bit too much this year, so I’ll keep it brief. Started circa 2011 by Tony Dapson. Went out of business the same year. Currently trying to rebuild on Indiogogo for the sixth time. Last seen in the wild: November 2011. Pink Elephant was founded by Roger Pink in Nelson, circa 1990. Pink Elephant is an odd one, insofar as it’s a brewery that’s done the reverse of what most breweries do these days. It’s gone from being a actual brewery, built of steel and concrete, which has been shut down in favour of becoming a contract brewer. And I guess that’s why they make this list, because the ‘brewery’ that was Pink Elephant no longer exists, even if the ‘brewing company’ does. Last seen in the wild: Still out there. Started 2013 by Vance and Wendy Kerslake. This was another single beer entity. Unusually their first and only beer was an Oktoberfest (amber lager). Last seen in the wild: July 2014. Formed by Nathan Crabbe (see Golden ticket). After Resolute he went off to brew for Four Avenues. Last seen in the wild: Whilst bottles of cider kept appearing as late as 2014, the records indicate it was last on tap in October 2013. Formed by Brendon Mckenzie, circa 2010. A single batch of beer produced – ‘ANTIFA Amber Ale’. Last seen in the wild: There are literally no records of this beer online. This is another strange listing on Beer Tourist. I have no idea where or when Rogue Brewery actually existed. There’s no record of them in Ratebeer or Untappd. There is a registered company under the name at the Companies Office, but nothing else can be found easily. I’d consider the Secret Seven a failed experiment. This was a single-batch contract brewery which came with a manifesto stating that beer should be about quality and not personality. I agree with many of the points they raised. I dislike the culture of star-struck fanboys that crops up from time to time in this industry (worst example: Garage Project’s 24/24). And I actively despise brewers who want to wrap themselves in the cult of personality, because the brewing industry in New Zealand is no place for wannabe rockstars. I think though, that Secret Seven missed an important point: yes, ‘craft’ beer has been built on quality, but it’s also been built on stories. People love to connect to the Who, the Where and the Why of the beer they drink. Frankly the story of ‘some Schmos made some beer’ I find neither compelling nor particularly original. Last seen in the wild: Their Amber Ale ‘S1’ (Like MUBS I assume the plan was to make S2, S3, etc.) was last Untappd December 2013. Please do not to slap the next Dave you meet after reading this. Also: 1895? Pull the other one. Last seen in the wild: The brewery doesn’t exist according to Untappd. There is only one lonely Ratebeer entry from from our friend Jono, dated June 2013. Formed in 2012, this was Kiearan Haslett-Moore’s contract label, mostly for collaboration purposes. He’s since gone on to set up North End Brewing, and so Southstar has faded away. Not from Stewart Island but named after the brewer, Tim Stewart. Founded in 2013. Made some really nice beers. Info on this one supplied by Jules Van Cruysen of XY Eats and Kiwi Craft. Last seen in the wild: April 2015. It’s unclear what’s moved into the premises, but with no check ins or updates on Untappd, we can assume the label is no longer current. Another one I wouldn’t believe existed, if I hadn’t had their cider. I maintain they were well ahead of their time. After it’s sale, Cider House became Crooked Cider (see above). Last seen in the wild: Ratebeer puts their end at December 2008, but I know I was drinking them regularly at Hashigo in early 2010. Started in 2012 by Lawrence Oldershaw, Two Fingers is the most recent brewery to make this list, closing in February 2015. Also spotted at another brewery. Last seen in the wild: Still plentiful, but will gradually die out. Velvet Worm is an odd one. They appeared in 2012 in Dunedin, started by a chap called Bart Acres and fell off the radar in 2014. I had them on the first draft of this list (their Facebook page was gone and their beers began to drop off on untappd), but took them off when I discovered that a company still existed under the name Stacpoole’s Brewing Co. and listing John Barton Stacpoole Acres as a Director. So I assumed that there is a direct continuity between the two, and possibly even a continuation of the Velvet Worm brand. I was tipped off again by Jules Van Cruysen that Velvet Worm is no longer an active band. A complete rebrand of a brewery is fairly drastic an action, and probably justifies the old label making this list. Waituna made the ‘Taakawa Indigenous Ale,’ a Golden Ale spiced with Kawakawa. Waituna never really appeared on the ‘Craft’ beer map (I don’t think I ever tried it). Started circa 2002, went out of business 2011. Last seen in the wild: One check in from December 2014, the previous ones from 2011. West Coast was started in 2007 by Paddy Sweeney, a self-styled West Coast Larrikin, a claim I’ve always found puzzling, since he lives on the East Coast. Of Australia. Anywho, the story of West Coast Brewing is the story of a bluffo-Kiwi-Bloke vs. bureaucracy and red-tape. At least that’s the book version, anyway. No really, he wrote a book about it. Apparently the red tape Sweeney was rebelling against was paying those pointless taxes the government keeps banging on about, because West Coast ended up massively in the hole to the IRD. The future of the company is unclear at this stage, but several moves to buy it back have been made by the original owners. Ultimately I include West Coast here because it’s been run pretty hard into the ground, and only really exists because of the strange vagarities of New Zealand Companies Law. Last seen in the wild: Still brewing, may very well pull through. Wests is a ‘beverage company’ (soft-drinks manufacturer) claiming to have been around since 1876. They’re still operational, but make this list because in 2004 they released a ‘Wests Ale’. I know this is a little before my remit, but I’ve included Wests because it’s fascinating example of a company outside the industry dabbling in beer. Last seen in the wild: January 2004. Yellow Cross, a brewery I admit I’ve never heard of, and stumbled across by accident. It seems like rather a tragic story: The only record of them is a Facebook page (no Ratebeer or Untappd). The page reveals their location used to be in Christchurch on Lichfield Street, between Poplar and Madras Streets. The page was updated regularly until February 2011. Many readers will be able to connect the dots here. Two weeks after the last posting, a massive earthquake totalled that entire section of the city. Many breweries were damaged in the Christchurch earthquakes, but no other breweries to my knowledge were completely put out of business. Last seen in the wild: February 2011, I guess. UPDATE: An ex-Cantabrian has informed me that Yellow Cross was a meat-market club. Others have have informed me that it was a DB-subsidiary. So how many breweries is that? For those who haven’t been counting or just skimmed the list (I don’t blame you), it’s thirty nine. That’s thirty nine ‘craft’ breweries (broadly speaking) that have gone out of business during the course of the ‘Craft Beer Revolution’ (broadly speaking). That’s a hell of a lot. It’s more than anyone I spoke to predicted; most people guessing about half that number. And I know that I’ve missed breweries off this list. There will be breweries out there that appeared and disappeared without leaving a trace, and even brewing companies that never even made any beer before they shut down. Likewise, although no one wants to admit it, there are small breweries out there that are currently circling the drain, and will go down in the next year or two. 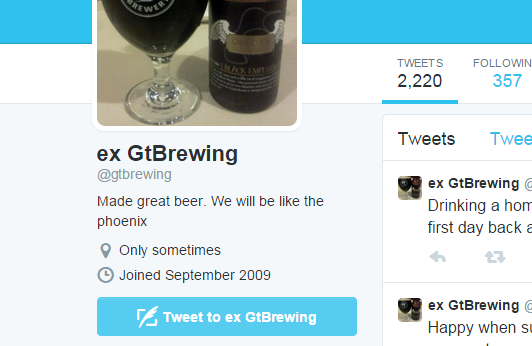 Conversely, there may be breweries that will rise, phoenix-like again. But I’m sure this list is at best, a low-ball estimate. But what can we take away from this list? When I started researching, I thought I would find one or two common reasons why breweries close. In reality there are many reasons, many of which could apply to both stainless and contract breweries: buyouts, poor business management, unsustainable business models, changes in life situations, falling-outs between partners, moving on to other project and so on. I didn’t find any single cause of brewery closure. What I did find though, is that there’s noticeably more contractors (22) than steel-and-concrete breweries (17). This is not entirely surprising, considering the sizeable commitment of setting up a brewing-plant, compared to the relatively minor paper-shuffling it takes to start a contract company. With more skin in the game, physical breweries tend to stick around longer. What’s more interesting, is the relative ages of the different types of breweries: the majority of stainless breweries that have closed in the last six years opened before 2009; before the start of the ‘Craft Beer Revolution’. Conversely, most of the of the contract breweries opened after 2009. If I can wildly speculate and generalise for a moment, I’d like to posit two ideas. First: the older stainless-steel breweries are more likely to close down because they have not been able to keep up with changes in the market place. Examples of this I think are Matson’s and Green Man. Both had been around for quite some time and been fairly successful in their day, but neither of them made particularly good beer or much of a splash in any other regard. When the market changed and consumers of ‘micro-brewed’ beer (to borrow an Americanism) began demanding more quality and innovation, their markets began to dry up. To put it bluntly, those breweries that fell behind, were left behind. Now my second point: the majority of contractors that have shut down, were started after 2009 and seem to have been short-lived. We see multiple companies that produced one or two beers, or even just one or two batches of beer before closing. That’s indicative I think, of the type of light-weight business model that contract brewing employs; and I don’t think that’s necessarily a bad thing. I think the time is also coming where we in the New Zealand brewing industry need to have a discussion about contract brewing. That discussion is too big to fit into this post. Maybe I’ll write about it soon. But I’ll offer up one suggestion here: starting a contract brewery is a hell of a lot easier than actually running a successful brewing business. A lot of people that get into the brewing game are not adequately prepared for the realities of the industry; and with relatively little at stake, they don’t last very long. But whatever. This is all speculation. For now, I hope you’ve enjoyed this stroll down brewing memory lane. Or at least found it interesting.